The left and right hemispheres of Albert Einstein’s brain were unusually well connected to each other and this may have contributed to his brilliance, according to a new study , the first to detail Einstein’s corpus callosum. The corpus callosum is the brain’s largest bundle of fibers that connects the two cerebral hemispheres and facilitates interhemispheric communication. The study was published in the journal Brain. Lead author Weiwei Men of East China Normal University’s Department of Physics developed a new technique to conduct the study. Men’s technique measures and color-codes the varying thicknesses of subdivisions of the corpus callosum along its length, where nerves cross from one side of the brain to the other. These thicknesses indicate the number of nerves that cross and therefore how “connected” the two sides of the brain are in particular regions, which facilitate different functions depending on where the fibers cross along the length. For example, movement of the hands is represented toward the front and mental arithmetic along the back. In particular, this new technique permitted registration and comparison of Einstein’s measurements with those of two samples — one of 15 elderly men and one of 52 men Einstein’s age in 1905. During his “miracle year” at 26 years old, Einstein published four articles that contributed substantially to the foundation of modern physics and changed the world’s views about space, time, mass and energy. The research team’s findings show that Einstein had more extensive connections between certain parts of his cerebral hemispheres compared to both younger and older control groups. 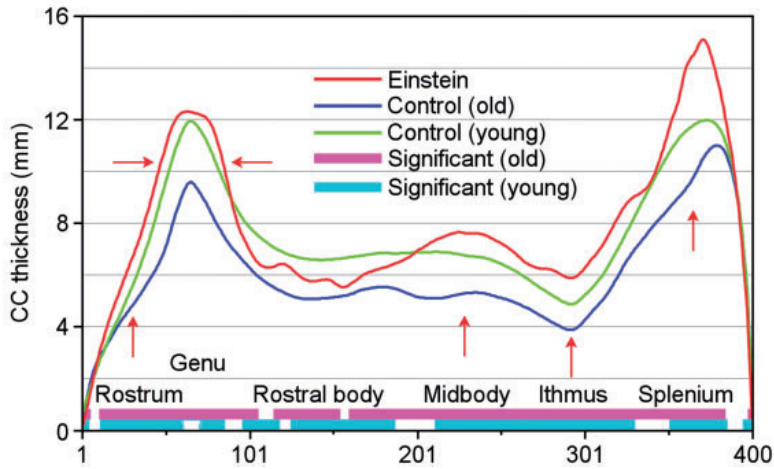 Specifically, they found that Einstein’s corpus callosum was thicker in the vast majority of subregions than their corresponding parts in the corpus callosum of elderly controls, and that Einstein’s corpus callosum was thicker in the rostrum, genu, midbody, isthmus, and (especially) the splenium compared with younger controls. The research of Einstein’s corpus callosum was initiated by Men, who requested the high-resolution photographs that Florida State University evolutionary anthropologist Dean Falk and other researchers published in 2012 of the inside surfaces of the two halves of Einstein’s brain . In addition to Men, the current research team included Falk, second author; Tao Sun of the Washington University School of Medicine; and, from East China Normal University’s Department of Physics, Weibo Chen, Jianqi Li, Dazhi Yin, Lili Zang and Mingxia Fan. Falk also found in previous studies [2,3] that Einstein’s brain had an extraordinary prefrontal cortex, and that inferior portions of the primary somatosensory and motor cortices were greatly expanded in the left hemisphere. More on Falk’s studies in the PBS Nova video, “How Smart Can We Get?” (10:00) and on Falk’s website and book, The Fossil Chronicles: How Two Controversial Discoveries Changed Our View of Human Evolution. Albert Einstein was arguably the greatest physicist in the 20th century and his extraordinary intelligence has long intrigued both scientists and the general public. Despite several studies that focused mainly on the histological and morphological features of Einstein’s brain after his death, the substrates of Einstein’s genius are still a mystery (Diamond et al., 1985; Anderson and Harvey, 1996; Kigar et al., 1997; Hines, 1998; Witelson et al., 1999a, b; Colombo et al., 2006; Falk, 2009). Recently, Falk et al. (2013) analysed 14 newly discovered photographs and found that Einstein’s brain had an extraordinary prefrontal cortex, and that inferior portions of the primary somatosensory and motor cortices were greatly expanded in the left hemisphere. Among these 14 images were photographs of the left and right medial surface of Einstein’s brain, on which the corpus callosum was shown with great resolution and accuracy. The corpus callosum is the largest nerve fibre bundle that connects the cortical regions of the cerebral hemispheres in human brains and it plays an essential role in the integration of information transferred between the hemispheres over thousands of axons (Aboitiz et al., 1992). The two photographs of the medial surfaces of Einstein’s cerebral hemispheres provide the basis for the present study.